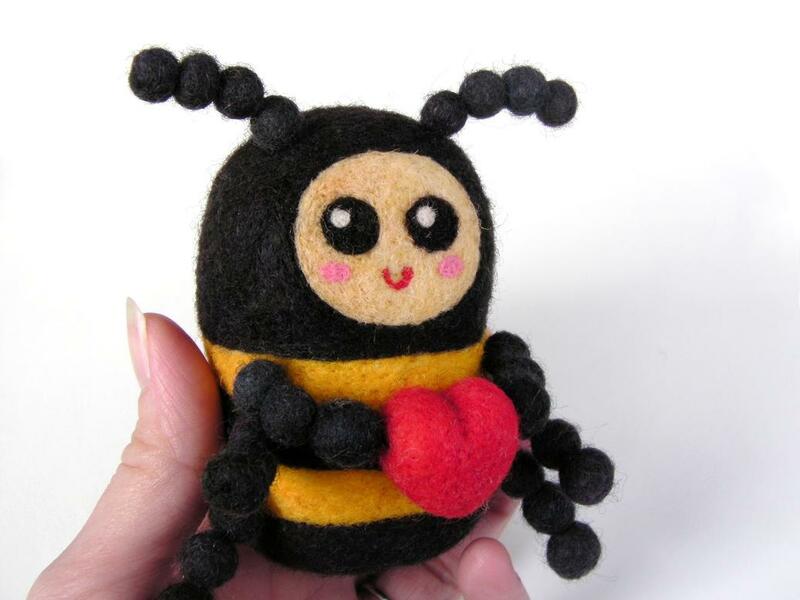 This little felt Valentine’s bee is so cute. 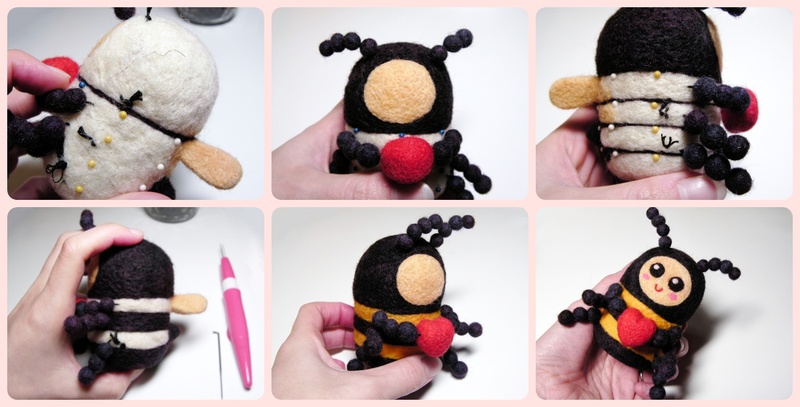 His body, legs, and antennae were all wet felted and the details were needle felted. A thorough tutorial on this little bee would be quite extensive; so I prepared a shortened tutorial. If you have any questions after perusing this simplified tutorial, please feel free to ask! In total, the bee takes about 6 hours to complete. 2 Wings(created the same way as these ears). 4 tiny beads are strung together for each antennae. 3 small beads are strung together for the bottom four legs. The second picture demonstrates how to thread the beads so that the two ends remain on one side of the beaded string. Thread the antennae and bottom four legs in this fashion. 3 small beads, one heart, and 3 small beads are strung together for the top legs/hands.The third picture demonstrates how to thread the top legs and heart. After the beads are strung, it is time to attach them to the bee. The antennae are attached right above the paper template. The legs are attached in the middle of each stripe(between the rows of straight pins). Now it’s time to add the stinger and wings. Spread out the unfelted end of the stinger, place it on the body, and needle felt into place. Be sure to remove any straight pins that are in the way. Now do the same for the wings. Needle felt a bit of beige wool around the very edge of the paper template. This will create an outline of the face. Then needle felt more beige wool on the inside of this outline. Adding the stripes to the bumblebee is very simple. Simply needle felt a black line along the top of each row of straight pins. Then needle felt the head with black wool. Add more black wool to the second and fourth stripe and needle felt into place. Then, add yellow wool to the first and third stripe and needle felt it. At this point, the whole bumble bee is “colored” in. Now size down needles(larger number) and needle felt the entire body once more; this will give a more finished look. Be sure to tack down the antennae and legs with a super strength felting needle until they are positioned as desired(a size 32 works really well for this). The final step is needle felting a sweet little face. Now the bumblebee is complete. I’m sure you will have no problem convincing that special somebody to “bee mine” when offering this handmade gift for Valentine’s!!! As always, good luck. And Happy Valentine’s Day!!! 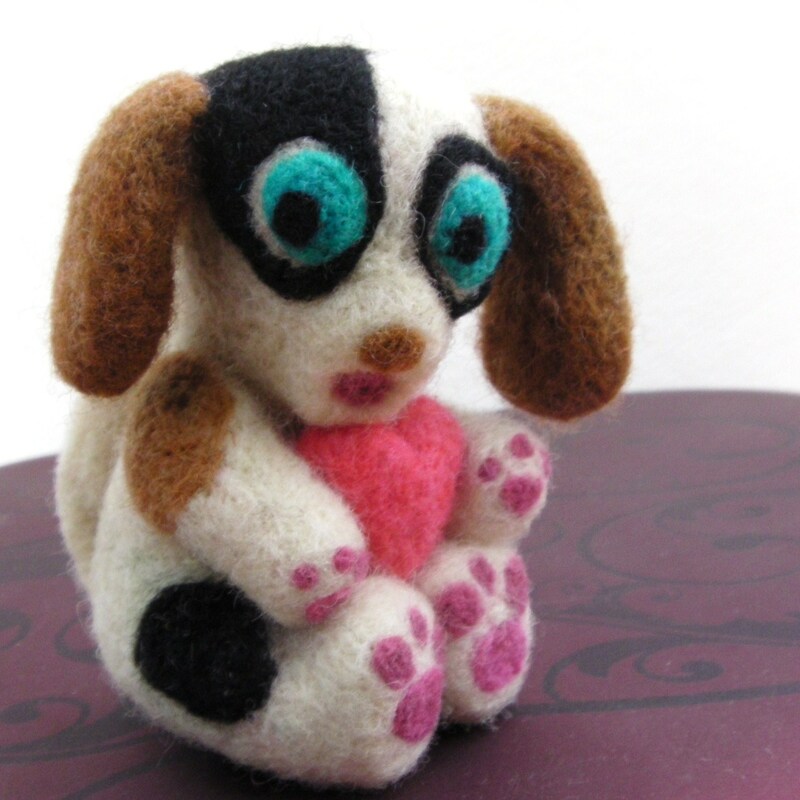 Needle Felted Valentine’s Day Puppy! 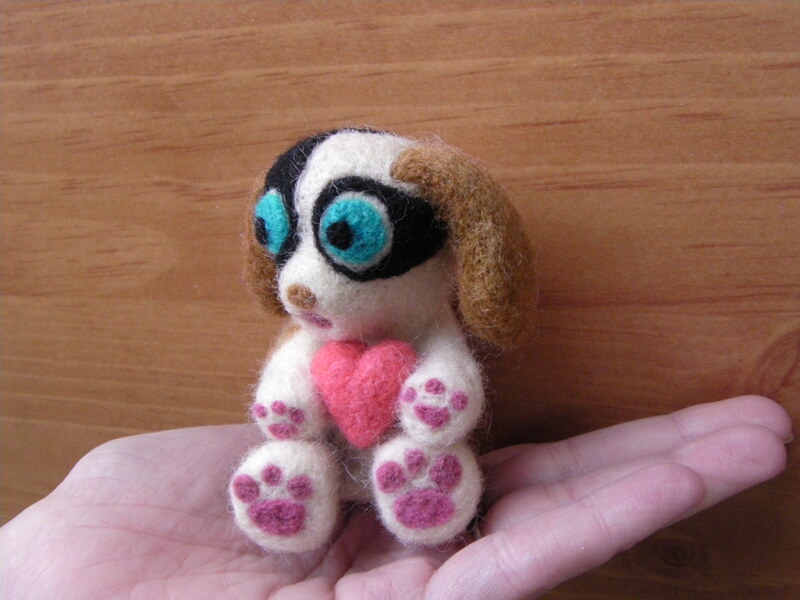 A little while back, I mentioned I was in the process of making a cute little needle felted puppy holding a heart. Well he is finally complete and ready to see the world! He took me five whole hours to make and the white on black turned out to be quite the struggle. But thank goodness he turned out so loveable! The inspiration for this little puppy came from my husband. 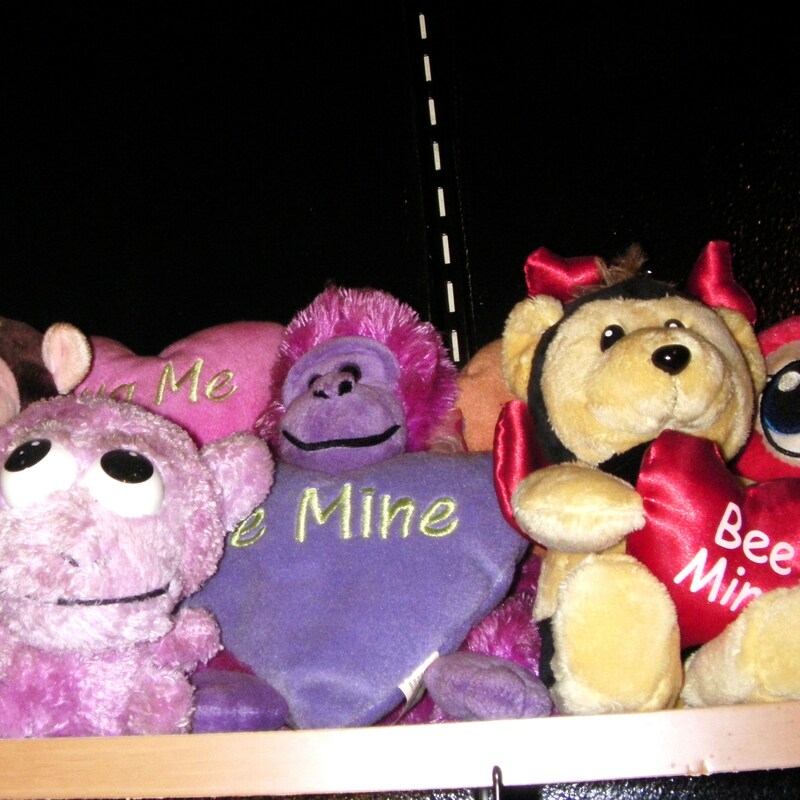 Every Valentine’s Day(we’ve been married 11 years) he showers me with not only candy but little stuffed animals. Most often these little animals are holding hearts. Thus the idea to felt a little puppy holding a heart was a very easy leap to make. Can you see the puppy that my husband gave me in the photo(all the stuffed animals are blocking each other)? He’s the third stuffie to the left! If I get any more plush animals, I will need a whole new shelf!!! Well, I suppose that is all for now; try to see if you can make a cute little Valentine for your “Valentine”. Until next time . . . 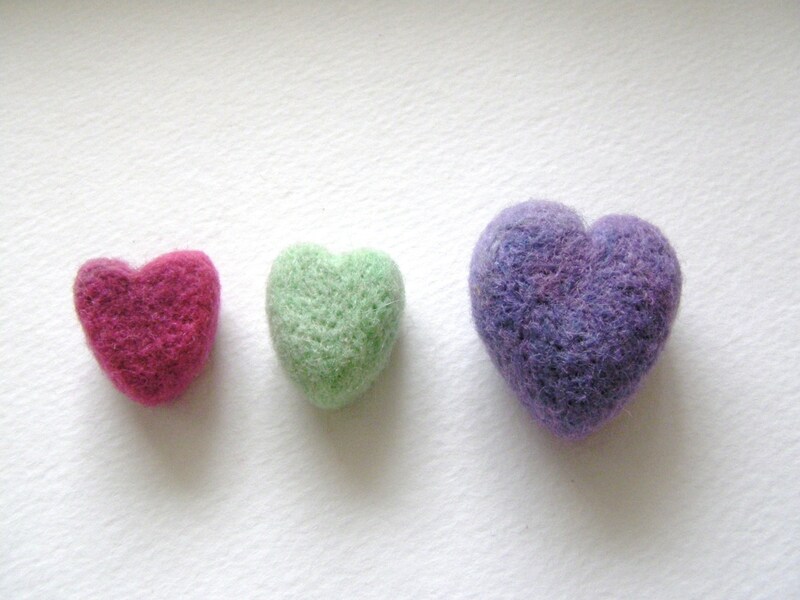 This is a tutorial on a great homemade gift for Valentine’s Day–needle felted hearts. These are super tiny, and super sweet; they remind me of those pale colored sweetheart candies! For the pros at needle felting this should be a breeze and for the newbies it will show you a little bit of what this craft has to offer. For those of you that are new to the idea of needle felting you will need a few materials. 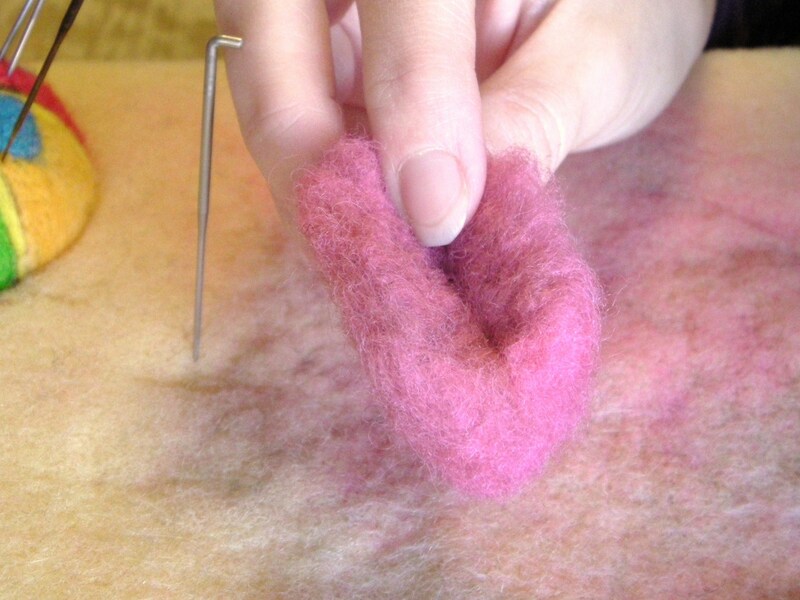 Felting needles have tiny barbs on them that knot the wool as you move the needle up and down. They are very sharp, so use caution especially around children. 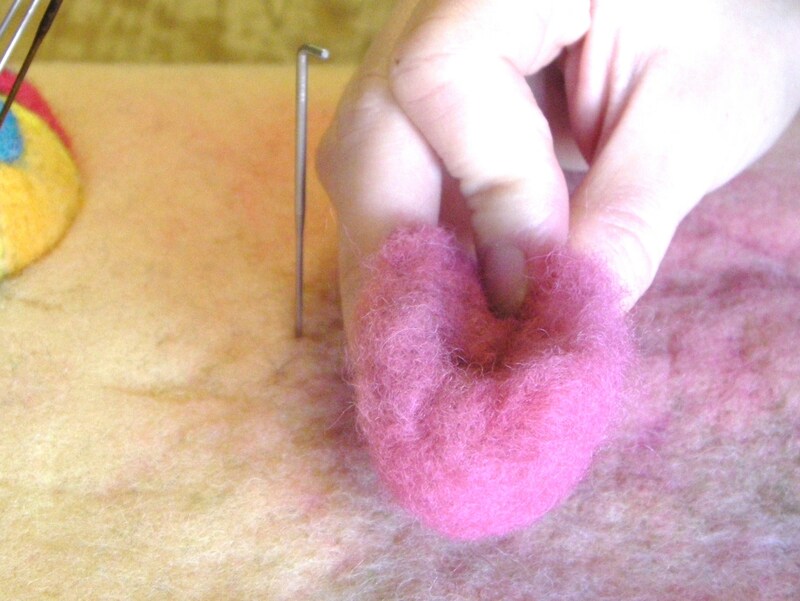 A foam pad or felting brush is necessary for a felting surface; the needles will break when they hit a hard surface. 1. First grab out a small handful of wool roving or batting. I have chosen a purpley pink colored wool batting. Next lightly shape it into a ball with your largest size felting needle; I used a size 36. Remember to do all felting on the foam pad surface. Simply push the needle in the wool over and over again. Turn the wool as you go to create a ball. Do not make the ball dense, just a very light felting at this stage. 2. Next felt a straight line down the top center of the wool ball. 3. Now look carefully at the photos below, this is a bit tricky to describe but easy to do. Place your finger in the center of the line you just felted and smush the wool down to one side of that line. Needle felt the smushed part flat. Next needle felt the other side of the line flat. These two smushed bits on either side of the line will be the top round parts of the heart in the end. The felted wool is beginning to take some shape now. 4. Next lets work on the sides of the heart. 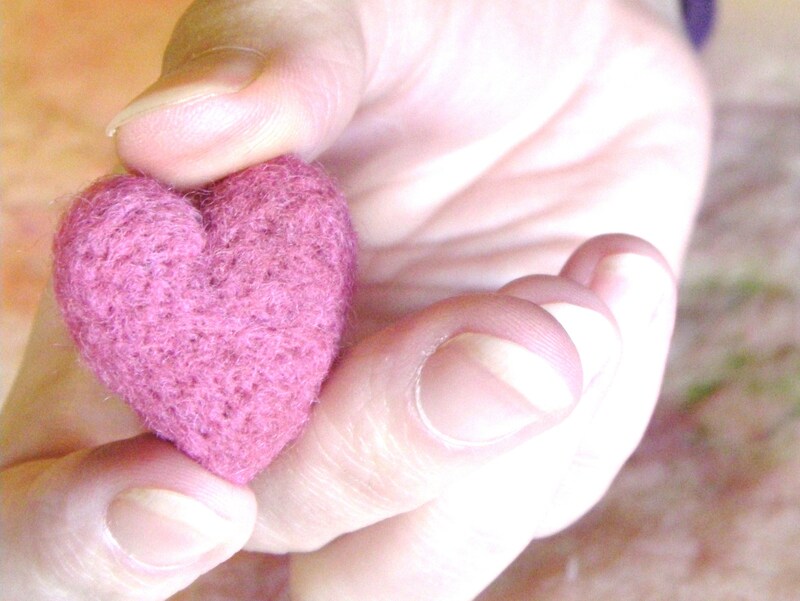 Lay the heart on its side, needle felt the bottom bit that will be the tip of the heart. Now, turn it on its opposite side and needle felt the bottom bit again. Now the heart shape is definitely alot more obvious. A bit wide, but that’s next . . .
5. Flatten the heart shape with your fingers and lay it on your foam pad. Needle felt the front and turn it over and needle felt the back. Next lay it on it’s side and needle felt the side of the heart and then the other side. At this point your little ball of felt should definitely be heart shaped. It is still a little soft. To get a great finished product we need to go down a needle size. 6. 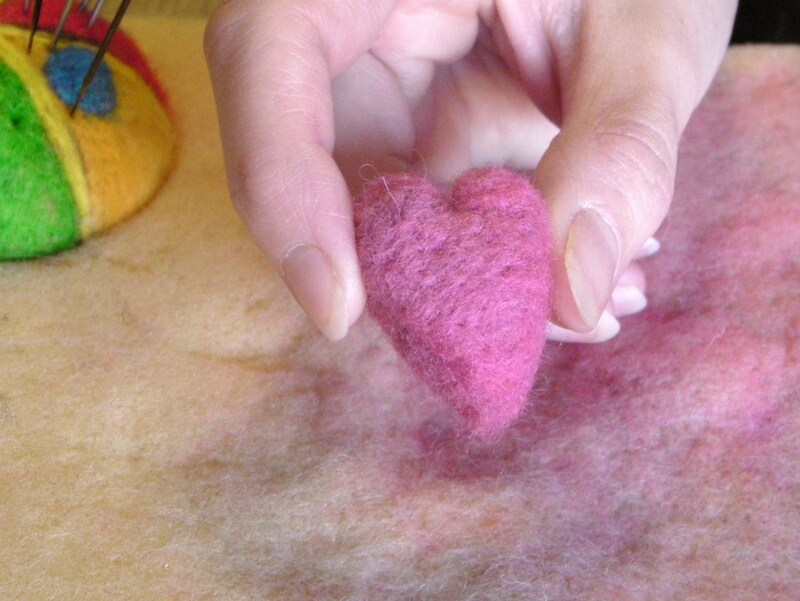 So grab a size 38 needle and felt the inside of the round top parts of the heart, then needle felt the front and back of the heart and then needle felt the sides of the heart. Be sure to pay close attention to the tip at the bottom and the indention at the top. 7. We grab a smaller size needle again(a size 40 needle) and repeat the steps in 12. 8. Now the heart is looking pretty good, but let’s finalize that perfect heart shape. Maybe your bottom tip is slightly off center or one side bulges more than the other. Simply grab your large needle again(size 36) and shape the parts that are slightly off. I usually focus on felting the tip of the heart and the top indentation at this stage. Just needle felt problem areas until you are happy with the shape. You did it, your Valentine’s Heart is now complete. It should be very dense at this stage and the shape should be to your satisfaction. These little hearts each take me 10-15 minutes to make. They would be a great Valentine for a loved one. You could attach them to a barrette for a child. Add some ribbon and hang them as decorations, use it as a gift topper, make it for play food candy hearts for your kids, or simply put in a pretty bowl as a decoration. I hope you give it a shot; they are really fun and quick to make once you get the hang of it. And if this is your first time needle felting, Good Luck! Valentine’s Day is quickly approaching. Being that my husband showers me with gifts each Valentine’s, I can’t help but be drawn to all the hearts in shades of soft pink and purples in anticipation! I began this felted task with a light heart and dreamily thinking of my beloved husband while pushing in and out with my sharp fantastic barbed needle in a size 36 T, but alas my swiftness and excitement were brought to an abrupt halt! I had managed to construct 2 hearts, before the accident happened. A larger purple heart and a smaller mint green one. 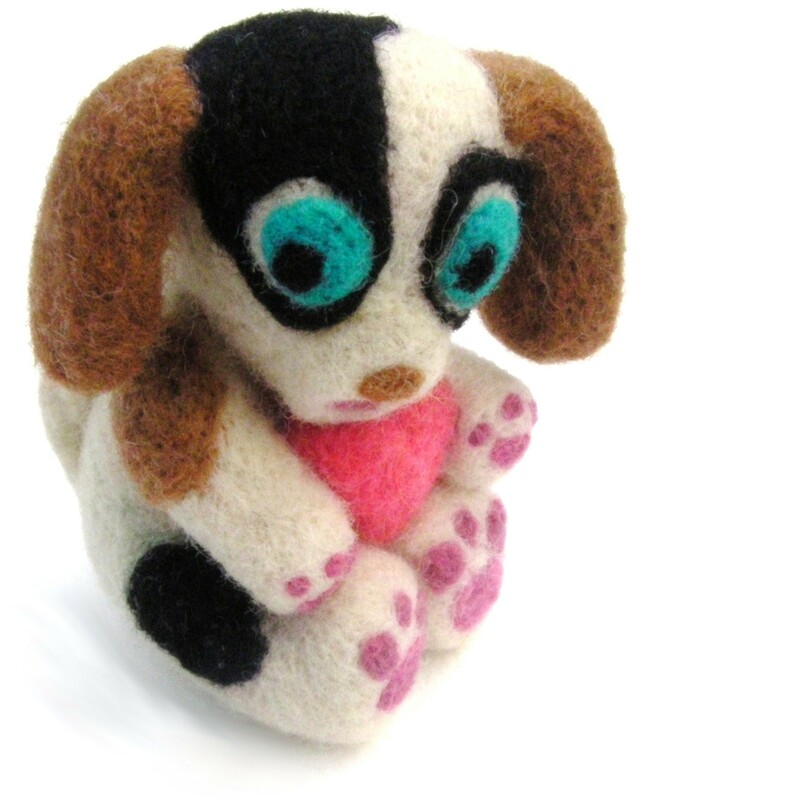 Then, while I was working on a Valentine’s puppy, my LAST 36T needle broke. I managed to retrieve the broken end and resurrect my puppy, but now I had only the wrong sized needles for the projects at hand. Not only, did I have to stop work on my puppy, but my bowlful of multicolored hearts that I had imagined also came to a quick stop. Now, that the sob story is out of the way; I will share the importance of this lesson. The lesson is this, “needle size does matter!”. A size 42 needle is going to get you nowhere, when you begin a new felted project a size 36 is a must to get you going efficiently; the soft mass of wool will simply take forever to felt if your needle size is too small. By the way, with felting needles the smaller the number the larger the needle and vice versa. 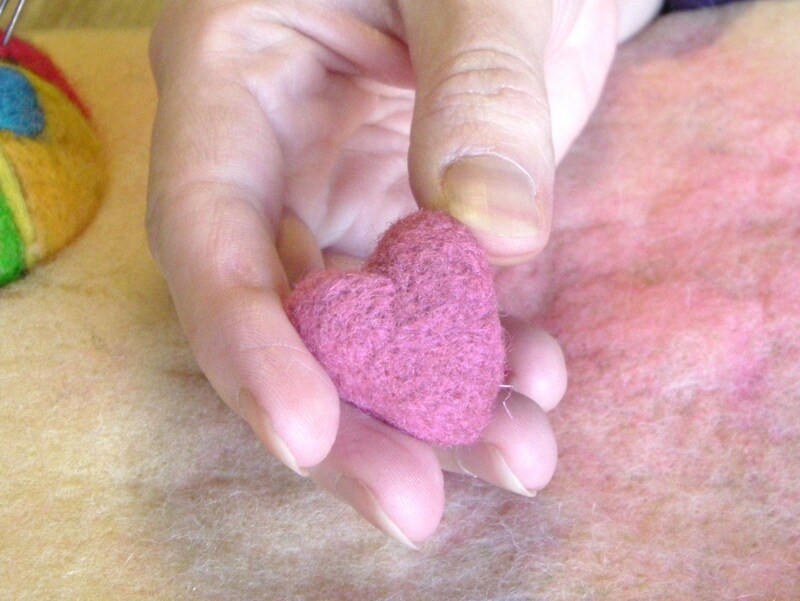 To visually display this phenomenon, I will use my green heart which I began felting using a 36 size needle and a pink heart which I felted with a 38 and 40 needle. The green heart(which I had the correct needle for the job!) is much denser than the pink heart. You can test for denseness, using what I call the “squish test” or “pinch test”. 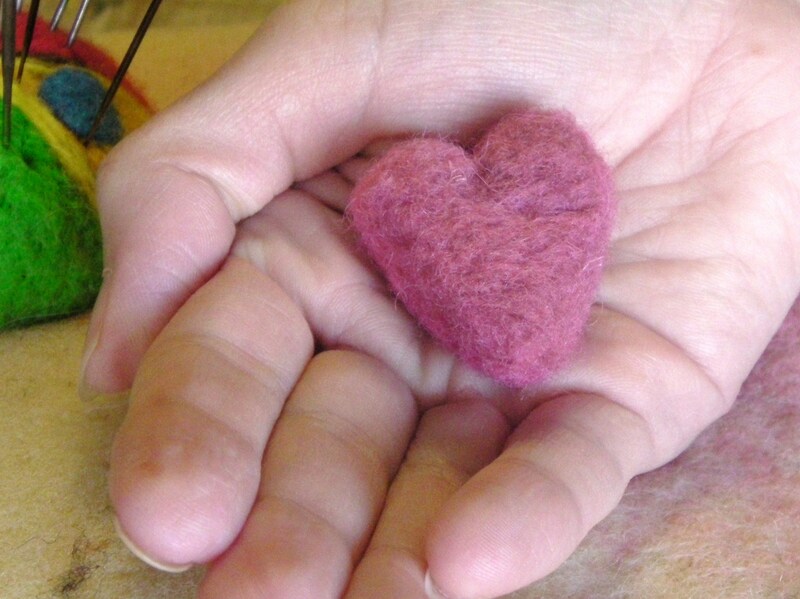 Simply “squish” the felted object between your fingers and see if it maintains its basic shape and when you release it, that it retakes its intended shape. In the images below you can see that the green heart maintained its shape and that the pink heart was much more squishable. Also I should add that not only will a larger needle(36) provide for a denser felted object, but they are much more efficient. My green heart took 10 minutes to felt and the pink one took 45 minutes and I was still not satisfied with the outcome! 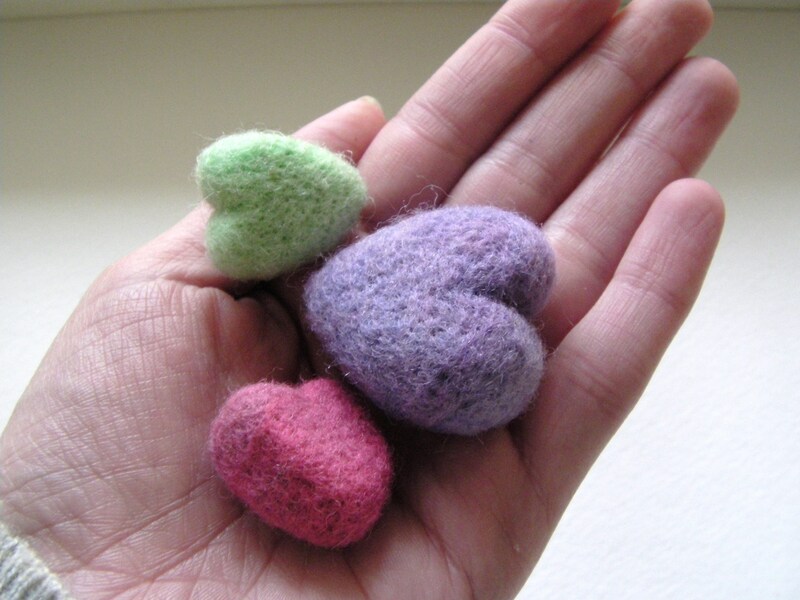 Squishiness and denseness is a matter of taste and style when it comes to your felted objects. Perhaps, felting a sheep, you might want a softer, messier look; but with most of the objects I felt I prefer a very dense, clean look. And I definitely think that the clean look is near impossible without the right needle. That being said, try your different needles and see which size you prefer for the beginning stage, like I said style and design can change your preference. But for me, I definitely think a size 36 needle is essential in the beginning stages in order for me to get my desired outcome. No worries, though, I have ordered 10 needles in a size 36 and they should be here very soon. Hopefully I can finish my puppy and bowlful of hearts before the big day!